The first women writers were either noblewomen or nuns, (often a combination of the two,) who wrote religious based plays. There was no intent to ever make their living from writing as they didn’t need to. The first female playwright is credited as being the German Hrotswitha of Gandersheim around 935-1005. She wrote Latin drama about female characters who are converted to Christianity. In the 500 years between Hrotswitha and Aphra Behn – we have the Dark Ages, when not much happened for the purposes of this essay. It’s only when the Renaissance started in the late 15th century that we start to get a huge creative outpouring, including plays and during this time that the first Elizabethan playhouse opened. But still it’s only those women married to Lords, or the independently wealthy, who were able to write, both because of their leisure time, and literally, because most people at the time couldn’t read and write very well, if at all. The first English woman to publish an original play was Elizabeth Carey, Viscountess Falkland, (1585-1639) – The Tragedy of Mariam the Fair Queen of Jewry. There is indeed only one working class woman recorded writing, Jane Wiseman – who was probably a servant, living sometime in the 1600s, and only her one play, Antiochus the Great, survives. Aphra Behn was born about 1640. Her life is something of a mystery. Tantalising glimpses and rumours can be gleaned from surviving works and biographies give exciting conjecture but not a lot of solid facts. The facts we do have tell of a woman most unusual for her time; and a story with so many fantastical plot twists that it wouldn’t be out of place in one of her plays. Like William Shakespeare, born almost 100 years before her, Aphra Behn lived in a world, unlike today, where you could be anonymous – in fact, for years at a time she disappears from the records giving rise to all sorts of speculation. She may have been the daughter of an illegitimate noblewoman, she may have been the daughter of a barber. She may have spent time in a British colony on the South American coast which inspired her novel Oroonoko, or she may have made it all up. Like William Shakespeare and other writers of the time, many of her plays were initially published anonymously, or under a pen-name. She was probably born near Canterbury, in 1640 to Bartholomew Johnson, a barber, and his wife Elizabeth Denham. Aphra, or Eaffry Johnson, was baptized on 14 December 1640. Elizabeth Denham was employed as a wet-nurse to a wealthy local family, which means that it is likely that Aphra spent time with the family’s children. She was clearly better educated than someone of her background would usually be: she could translate French, she alludes to the Classics in her plays and takes part in the scientific, philosophical and political debates of her day. Little is known of her early life, she may have spent time in an English sugar colony on the Suriname River, on the coast east of Venezuela. During this trip she is supposed to have met an African slave leader, whose story formed the basis for Oroonoko, one of the earliest English philosophical novels and a book with an anti-slavery stance to boot. Shortly after her return to England in 1664, Aphra Johnson may have married a merchant Johan Behn. There is little evidence of their marriage, it did not last for more than a few years and her husband appears to have died. But perhaps, as some believe, she made him up. It was easier for a widow to lead an independent life. Behn was dedicated to the restored King Charles II. By 1666, she had been recruited to spy on the Dutch for the king. Her code name for her exploits is said to have been Astrea, a name under which she published many of her writings. Astrea didn’t receive payment for either her services or her expenses whilst abroad. Money was borrowed to get her back to London, where a year’s petitioning of Charles for payment went unheard, and it is possible she ended up in a debtor’s prison. But by 1669 an unnamed source had paid Behn’s debts, and she was released from prison. In a way Charles did her a bit of a favour, as from this point she had to make her living from writing and was one of the first English women acknowledged to do so. She cultivated the friendship of various playwrights, and starting in 1670 she began producing plays and novels, as well as poems and pamphlets. Her most popular works included The Rover, Love-Letters Between a Nobleman and His Sister, and Oroonoko. How she got her first break we don’t know – but her first play shows a good knowledge of theatrical techniques. She tailored roles to suit the leading actors in the company. She exploited the resources of the theatre using the new technical devices, such as trap doors, that had only been recently invented. Restoration Comedy is notorious for its sexual explicitness, a quality encouraged by the libertine Charles II. The socially diverse theatre audiences included aristocrats, their servants and hangers-on, and a substantial middle-class segment. These playgoers were attracted to the comedies by up-to-the-minute topical writing, by crowded and bustling plots, by the rise of the first celebrity actors and by the introduction of the first professional actresses. Before the closing of the theatres, (1642 – 1660,) all female roles had been played by boys, and the predominantly male audiences of the 1660s and 1670s were curious and delighted to see real women engaging in risqué repartee and taking part in physical seduction scenes with plenty of flesh on show. In this age of libertines, Behn should have fitted right in. She was quoted as once stating that she had led a “life dedicated to pleasure and poetry.” She lived as she wrote, a Bohemian life where she wanted sexual freedom and equality. But the times were not so free and easy for a women who was behaving like a man. In writing plays like a man (ie, examining sexual and individual freedoms, questioning women’s roles as wife and mother,) she opened herself up to criticism and ridicule and was forced to often defend her right to write in prologues, or epilogues. In 1682 things started going wrong – Aphra Behn was briefly arrested for attacking the King’s illegitimate son in an epilogue to her play. Although the epilogue was pro-Charles, he didn’t like the slight against his son. A lifelong supporter of the fickle Charles II (even after the way he treated her,) and probably a Catholic, she was heartbroken when Charles died in 1685 and also when the Protestant William of Orange came to the throne. In her final years her view on whether a woman can be as sexually liberated as a man has altered somewhat. She still believes a woman may pursue a hedonistic lifestyle inside or outside marriage, but she will pay for it with social censure. Her last play in 1687 – The Emperor of the moon – was a dazzling spectacle, after The Rover, her second most successful play, it utilises a lot of tropes from pantomime. 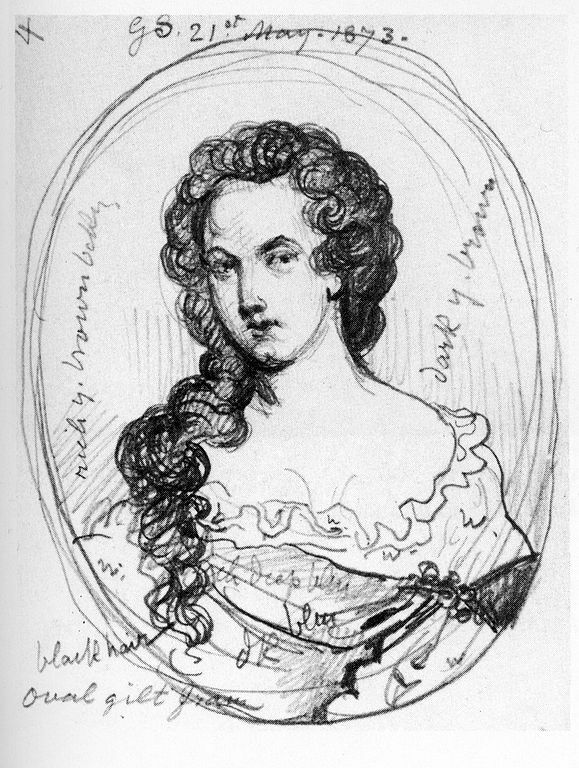 The Victorians found both Aphra Behn and her writing indecent, so the writer and her work disappeared, but more recently there has been a growing interest not only in her work, but an acknowledgement of what she achieved for other women writers who came after, and she is now studied on university courses worldwide. Vita Sackville-West called Behn ‘an inhabitant of Grub Street with the best of them, . . . a phenomenon never seen and . . . furiously resented.’ Many critics at the time, and now, believe that her writing was not very good, in fact from a 21st century perspective some of it actually seems reactionary rather than radical, but this loses sight of the reasons why she is so important. Aphra Behn’s contribution to the history of playwriting is vital; she was the first professional woman writer to make her living from writing. She wrote about women’s roles in a man’s world, delivering plays that a mainly male audience would watch, and her writing is deeply embedded in that time, yet born from her unusual situation and her very unusual character. Prior to Aphra Behn all the plays we might study or see performed were written by men. 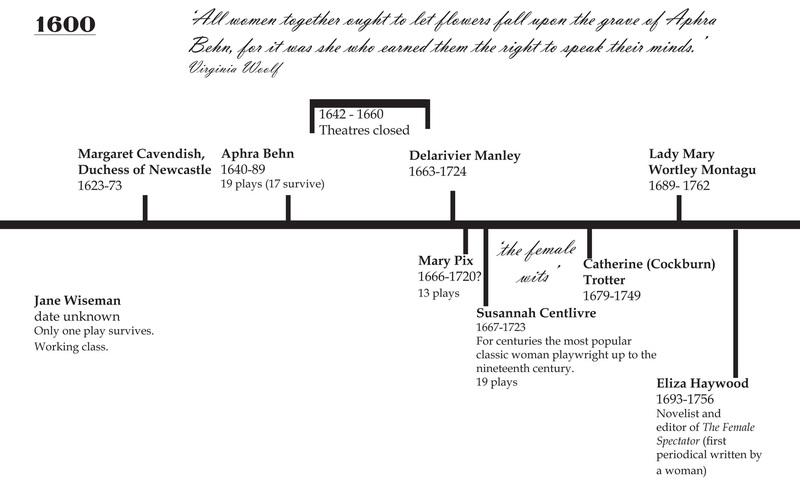 Aphra Behn started the long journey to acceptance and equality for women playwrights; a journey we still have a way to go on.